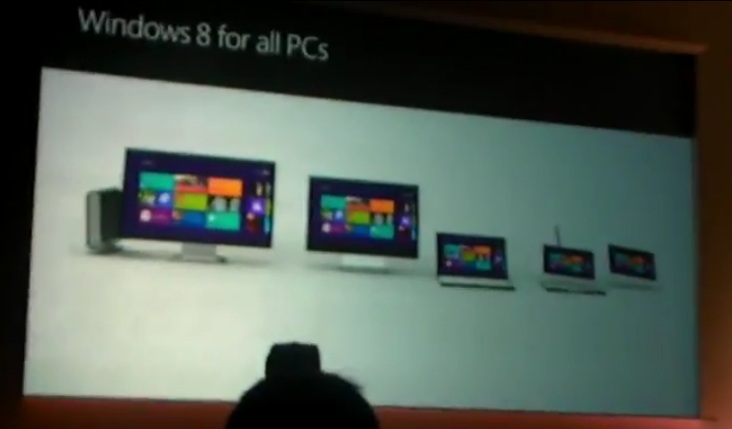 Video: Windows 8 Tablet demo! I want one of these now! AND works well with keyboard and mouse. Apps are borderless. Every pixel is your app. No title bars, no system trays, no scroll windows. Gestures – left to right swipe to bring up control bar. Swipe up from bottom to get to the controls. I know some will say it’s like BlackBerry’s playbook who some have said in turn is stolen from WebOS. N900 has also had some lovely side gestures (not requiring actual gesture hardware in bezel). Windows work on the side, apps top and bottom. Snap view – two apps side by side. (Well finally, this gives me good use of that screen real estate. My Windows desktop experience is full of side by side programmes). You can drag to determine how much space each uses. Internet explorer 10. Drag bar at top for tabs. Has FLASH. iPad say what? Standard QWERTY or ergonomic qwerty for thumbs. Cheers Rick for the tip! « Elop Shows the Nokia N9?